Quality multi USB mains charger. 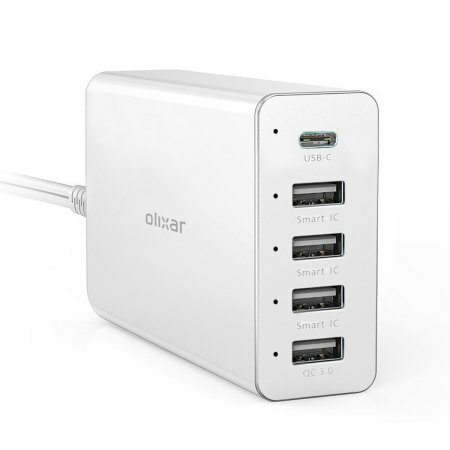 Well constructed, fairly heavy duty multi USB mains charger with five ports. One being fast charging and one USB-c. As described, seems to deliver as promised. Satisfactory performance. Aesthetically pleasing. This will do nicely for the two rooms in the future holiday home when it’s ready in the summer ✔️???? This is so good we have three! We always travel with one too! Our family (two adults, two teen-agers) needed a solution for charging smartphones, drone and other devices and I must say Olixar charger do the job. It's very robust and effective. Works exactly as described. Neat, compact unit. This does exactly what it says in its description. Very useful to be able to charge more than one device from a single point. great product, has just the right amount of ports for my charging needs, and it seems to be well made! Does exactly what I needed. Powers up my Huawei C USB fast charge port plus others ready to go. Powerfull charger that can handle up to 5 devices at same time. Very usefull when traveling, only one charger to carry for all electronic devices you have. Could not get LG Gpad to charge beyond 20% and then it would go backwards. Excellent quality. I would recommend to anyone. It looks very smart & is excellent. Delighted with our purchase as always from Mobile Fun. Looked for a while for something similar to this - this has standard USB, C-USB and also a fast charger port which is great for tablets or getting 25% onto a phone before heading out for an hour or so. Don’t know why I didn’t buy this before , great looking and now we can all recharge together. Good thing, very convenient in use. Great product, powerful ports and decent size, I've got a few of these now, use them at home, at work, great product. Does exactly what it needs to do, charges up different electronic devices at the same time. Lightweight, which will make it easy to take on holiday. Grandchildren love this charger they can all use it at the same time with their different appliances. Great product I should have purchased this item long ago! If you have a phone, iPad, earphones any usb chargeable kit this is ideal! It’s mega fast charging is fantastic when you need things charged asp this is the one to get!!!! I had a two-port charger from a well-know hight street electronics store (sadly no longer with us) but as more and more devices become USB powered I needed more ports and more capacity. This kit fits the bill while still being light enough to carry. A great little mains charger. Light and compact. I use it around the world. Excellent charger for all devices. I have had this for two weeks now, and it charges all of my USB powered devices extremely well and very safely. I really do recommend this charger to anyone wanting a universal charger. Mobilefun.co.uk give excellent delivery times, and for that reason I recently bought an Acme fitness monitor from them too; it too works very well and gives me an idea of how much more excercise Ineed to try to achieve. Great supplier and will be buying from them again in the future. Charges quickly. Convenient. Seems well built but only been using for a month. Like all the Olixar stuff I’ve bought from MF it does what it says on the tin. Terrific piece of kit to have around. This super fast mains charger is great for charging mobile phone, vapeing batteries and back up power supplies all at the same time. One of the best purchaces I have made so far this year. I recommend it very highly for those who need to keep their tech items charged without any hassle. Delivery was over an hour earlier than advised on a next day delivery, Awas from DPD was his usual happy and very polite man. As usual, Mobilefun. co .uk has delivered a great product at the right price and delivered it earlier than was quoted, thanks guys! Excellent charger small, compact ideal for taking on holidays. Nightly charges my iPhone and iPad in a few hours. Great product, marginally preferred the previous version which had 5 USB outputs, which seemed a little more flexible, but just needed one new cable and this one works really well at charging many things at the same time. Does what it says on the tin and is particularly useful in our house at time of visits from multiple grandchildren who nowadays bring multiple electronics when they stay - provided you keep reminding them to recharge items! I very much like this 5 Port Charger and 50 watts is a big bonus,so small and easy to pack when you need to carry a charger. Another bonus i can charge 3 or 4 items at one time very handy on the train.A very good buy. Very pleased with this charger it saves using 3 different chargers only takes up 1 socket and charges phone and tablets efficiently. I was that happy with it i purchased a second one for work !!!! Charges my phone and power bank very quickly. Brilliant pice of kit. All five ports used together are supper fast and its compact. I got really charged up on this Olixar unit, fully recommend this as with all of their products, never had a problem with any. Bought this charger unit to cut down the number of plug sockets required to charge the numerous phones and tablets in the house. This is a compact, lightweight and high quality product replacing a bulkier charger and my wife even carries it in her handbag (a first with any product). However, I have one criticism - it does not fast charge every product only those designed to accept a fast charge.This should be made clear in the product description. Otherwise a highly recommended product from a high recommended company.